We know it’s still January and we’re still almost a year away from the iPhone 11 being released, but that isn’t stopping people from putting their creative juices to the test by putting together concept images and videos of what it might look like. The latest video shows us what we might be buying in September, and it looks pretty cool. The video is based on schematics that have been popping up via the supply chain of late, as well as renders that themselves were also based on those schematics. 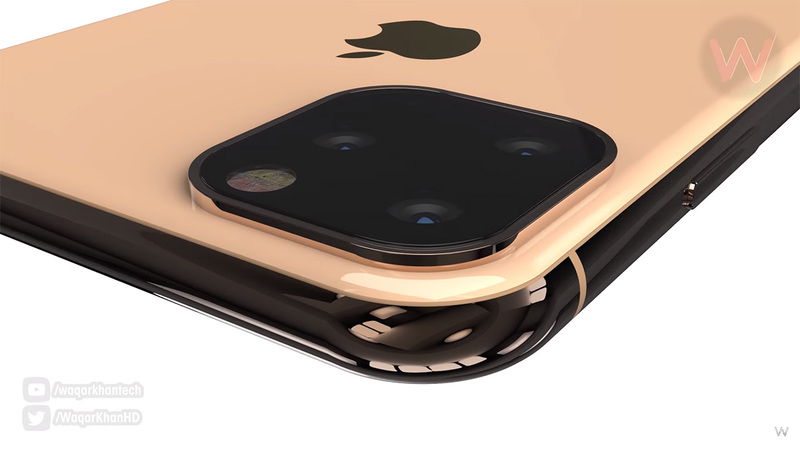 The result is an iPhone that looks very much like an iPhone XS or iPhone XS Max, but with three cameras around the back rather than the two that we have become accustomed to seeing. That extra camera makes for a sizeable camera bump, and we’re honestly not sure how we feel about it. We’re not normally ones to be concerned about a camera bump here and there, but with such a huge slab of camera protruding from the back of this thing, we must admit to being a little concerned about how things might turn out. That being said, the video, courtesy of YouTuber Waqar Khan, is a fun watch and ticks all the boxes of what you might expect from an iPhone promotional video. Renders in Space Gray, Silver, and Gold are all included in the video and yes, there’s a notch there for good measure. There’s no fingerprint sensor, so anyone hoping for a return of Touch ID will be out of luck if this video is any indication. Apple isn’t expected to take the wraps off the new 2019 iPhone lineup until September at the earliest, so we don’t expect the real juicy details to start leaking for a good while yet.